In the previous page, we left off with an image you inserted and resized. 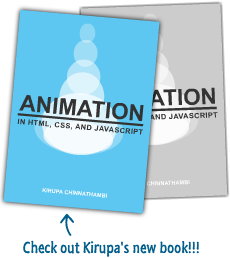 In this page, let's move on by turning your image into a button and looking into its template. What we want to do is create rollover effects on a button. While that conversion is entirely optional, you will find that it becomes much easier when you go from an image and towards a control such as a button that has more functionality for dealing with mouse interactions. Once you have changed the name, hit OK to close this dialog and to convert your image into a button. 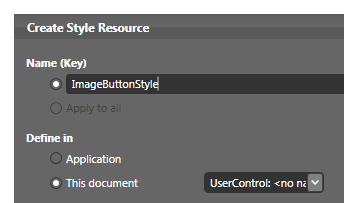 With your image now converted into a button, it is time to dig into its template and see the internals of what your newly converted button is made up of. With your button now selected, go to the breadcrumb bar found towards the top of your artboard. You will now find yourself editing your Button's template. A "template" is basically the name referring to all of the various things that make up the internals of your control. This text displayed via your ContentPresenter is not very important for us, so hit your Delete key to go ahead and remove it. Great - you now have your button setup just the way you want for how it looks by default. The last thing that remains is adding the different look when you rollover or click on the button. Let's look into that on the next page.